Wow. This one is a mind blower. Towards the end of this review I am going to talk about the finale of the story, so be warned. If you don’t want spoilers, don’t read too far ahead. One of the things I often do not care for in a comic book story is when many different artists are used on a single tale. The times I do like it are often when the story is divided into distinct chapters, and the change of artist helps reflect the difference in the narrative. That is not what happens here. Rather, a variety of contributors have their work scattered throughout the tale. And yet, it works. I had no problem with this whatsoever. 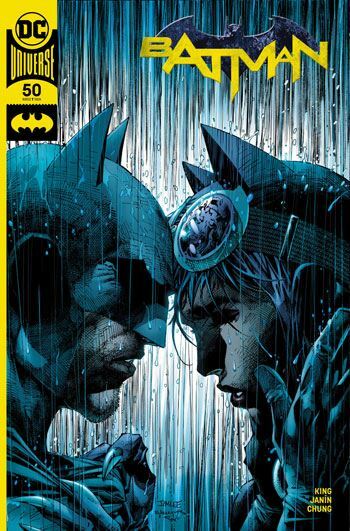 Partly this was due to the high quality of the artwork, but also because the art was used to convey the long history of Batman and Catwoman’s relationship, with different costumes, different time periods. Using different artists just added to that. I also complained, in my last review, about the tendency that Tom King has towards stories that are conversations, with little actual action. You know what? That happens here as well. Did it bother me? Not a bit. Batman and Catwoman are both going through a lot of soul searching during the day leading up to their wedding. There are a number of very funny moments. Alfred is always good for those. I love the logic in picking the judge, for instance. But these scenes are interspersed with what turns out to be letters that the two are writing to each other. The letters allow one into the innermost thoughts of the characters, expressed in a way both of them have trouble doing when actually talking to people. I posted a teaser on twitter a few days ago when I finished reading this issue. I commented that I laughed and cried, and both of those things happened during the course of the tale, before I hit the ending. If you don’t want spoilers, stop reading this now. The ending is a real double punch to the guts. And yet it rings so true. Both of them decide, independently, that marriage would “ruin” the other one, and their love is strong enough that both put this before their own desires, resulting in both ditching the other at the altar, so to speak. I guess technically they aren’t doing that, as neither makes it to the altar. Then there is the final page. The big reveal. The final twist of the knife. Both of them have been being played all along, and neither has any idea of how they have been victimized. Up to that moment, this was just a really, really good Batman story, true to the melancholy nature of the series and the character. Now it is something else. I truly loathe the ones responsible for this, and long for Batman and Catwoman to find out what has actually happened to them. This opens up the story, rather than closing it off, and makes me very excited for what is yet to come during King’s tenure on the book. Bravo to all involved. You executed an issue beyond my wildest expectations.